The importation of English merchandise into Virginia during the 17th century to meet the needs of its inhabitants was the beginning of a vast colonial trade which helped to increase the wealth in England and also gave her the undisputed supremacy among commercial nations. As early as 1664, when the second Act of Navigation had been in operation only a few years, the merchandise imported into Virginia and Maryland was thought to be worth 200,000 pounds annually. This equates into purchasing power of today to about four or five millions of dolars. At the beginning of the Revolution, the value of goods shipped from England each year to her colonies was estimated at 2,732,036 pounds. And this was under a restrictive tariff. The mother country imposed stiff regulations on trade and exchange, and they wrote laws to prevent dutch ships from trading in the colony. But the colonists preferring the more economic trade with the dutch ships, did little to block their trade. 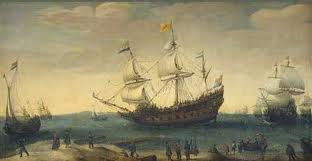 In 1623, Governor Wyatt was put in a quandry as to whether or not to allow a dutch ship which had passed at sea with the intention of making a voyage in Virginia, to exchange supplies for his principal commodity. Earlier, during the Jamestown settlements, the Virginia Company had sought to enforce tobacco and sassafras from all independent trade. Source: British State Papers, Colonial, vol. ((, No. 26, Governor Wyatt to John Ferrer.